The Pacific War Online Encyclopedia: Tinker, Clarence L.
Clarence Tinker graduated from Wentworth Military Academy in Lexington, Missoury, before joining the Philippine Constabulary as a third lieutenant. He transferred to the Regular Army in 1912. In 1921 he took flight training and joined the Air Corps. 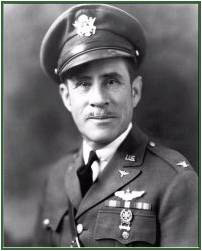 He became a major general shortly before the attack on Pearl Harbor and relieved Martin as commander of Hawaiian Air Force shortly after the attack on Peal Harbor. While directing Air Corps operations at the Battle of Midway, Tinker went out as an observer in a night flight of Liberators raiding Wake Island. His plane never returned. He was the first American general to die in the Second World War. Johnsen (in Hesse et al.1998) reports that Tinker's aircraft appeared to stall and crash into the sea. Tinker one-eighth Native American of the Osage tribe. He was known for his physical courage and executive skills.